Trigonometry for Engineering Technology teaches the fundamentals or right angle trigonometry while also placing strong emphasis on examples from the field of engineering technology. Written for those without prior experience in the subject, as well as those who need a refresher, its intent is to engage students in a topic that many might otherwise consider unimportant in a future career. May also be found useful by manufacturing companies with in-house training programs. Emphasizes examples from the fields of engineering technology for students who are studying to prepare for work in those fields. Many examples and exercises include illustrations to enhance the explanation of real-world scenarios. Each chapter includes example problems that demonstrate a problem-solving procedure for specific problem types. The example problems are followed by exercises that the students solve for practice. 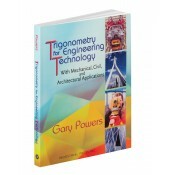 Several chapters are included to supplement the right angle trigonometry topics, including Law of Sines, Law of Cosines, and graphing trigonometry functions. An open format allows students to use the text as a workbook in class and during study. Includes answers and solutions to exercise. Some mechanical parts may have a surface that is angled to the rest of the part. An example of this is shown in Figure 8.3. There are several methods for specifying the tolerance of this angle. One method is to use the basic angle-tolerance which is shown in the title block as +/- 0° 15'. A basic angle tolerance is measured directly using a bevel protractor. If the tolerance must be much closer than a basic angle tolerance, then an angularity tolerance can be specified as shown in Figure 8,3. 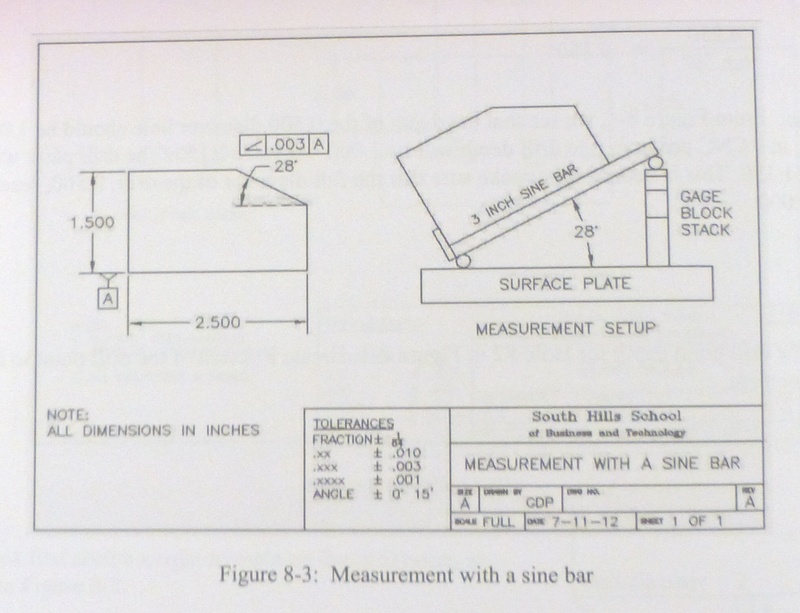 Angularity is part of a tolerancing system called Geometric Dimensioning and Tolerancing (GD&T). If an angularity tolerance is specified, it takes precedence over the basic angle tolerance shown in the title block of the drawing.